In the new year, I wrote a post about expecting the miraculous in 2014. 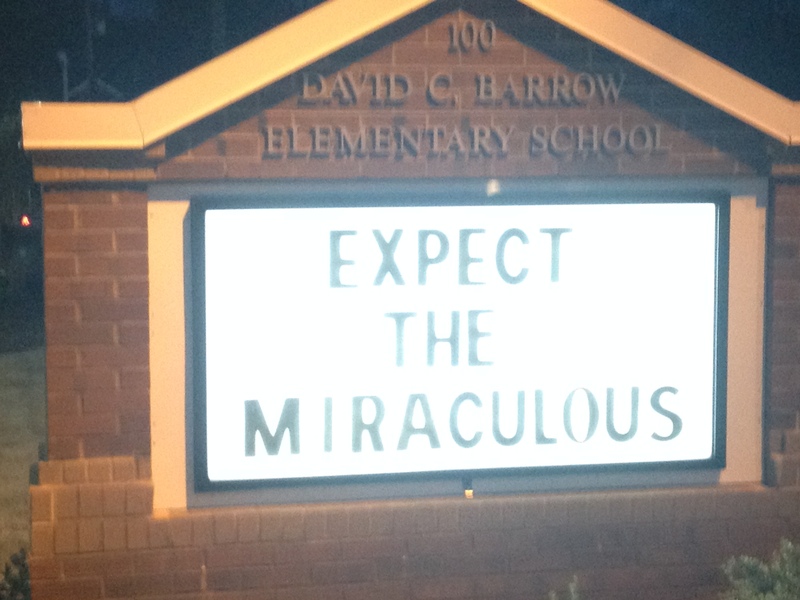 I can honestly say that the expression “Expect the Miraculous” has taken on a life of its own in our school. Let me tell you how it happened. To kickoff the second half of the year, we held a schoolwide assembly. The purpose of the assembly was to review goal setting, celebrate our unique talents, and to give ourselves permission to have dreams. It really was an amazing assembly. We had student performances, a teacher who played her violin, a youtube video from Kid President, and Martin Luther King Jr contest winners. The assembly was also a space for me to talk about expecting the miraculous. 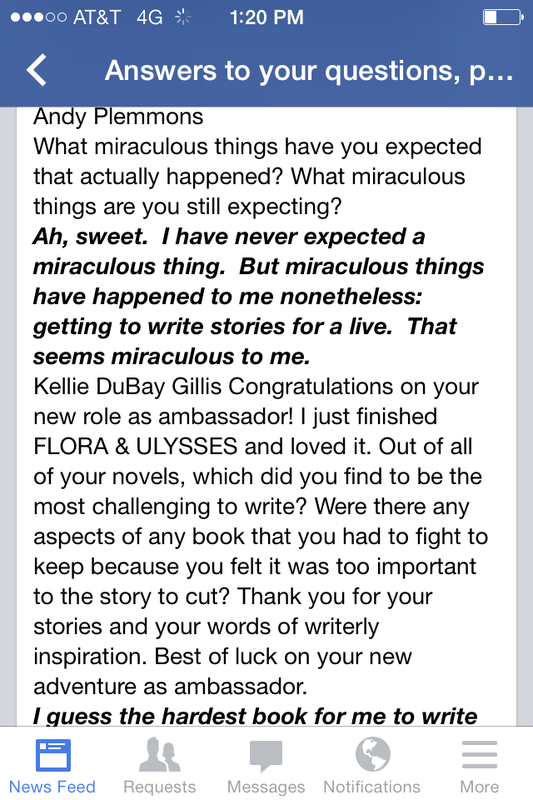 I read the excerpt from Flora & Ulysses: The Illuminated Adventures. I also shared synonyms for the word “miraculous” such as “extraordinary”. Finally, I told my own story of expecting the miraculous. My story involved our new 3D printer. From the day I heard about 3D printers, I expected that one day our library would have one. I wasn’t sure how or when, but I felt in my heart that this incredible piece of technology was something our students should have access to in school. About a year ago, our district considered purchasing a 3D printer for our school. It was all the way down to the ordering process, but something happened over the summer and it didn’t get order. Still…..I expected the miraculous. I wrote grants and began advertising the idea of purchasing a 3D printer. I publicized that a portion of our book fair profits would go toward 3D printing. However, this was a slow process and I knew it would take time to raise almost $3000 for a printer and supplies. Still….I expected the miraculous. Then, in October, Makerbot announced their partnership with Donors Choose. I immediately submitted my project and hoped for the best knowing that much of the available funding would most likely go to Brooklyn schools. Still…I expected the miraculous. Miraculously, our printer was funded overnight! This is the story that students heard. I followed this with an invitation for them all to “Expect the Miraculous” with me. 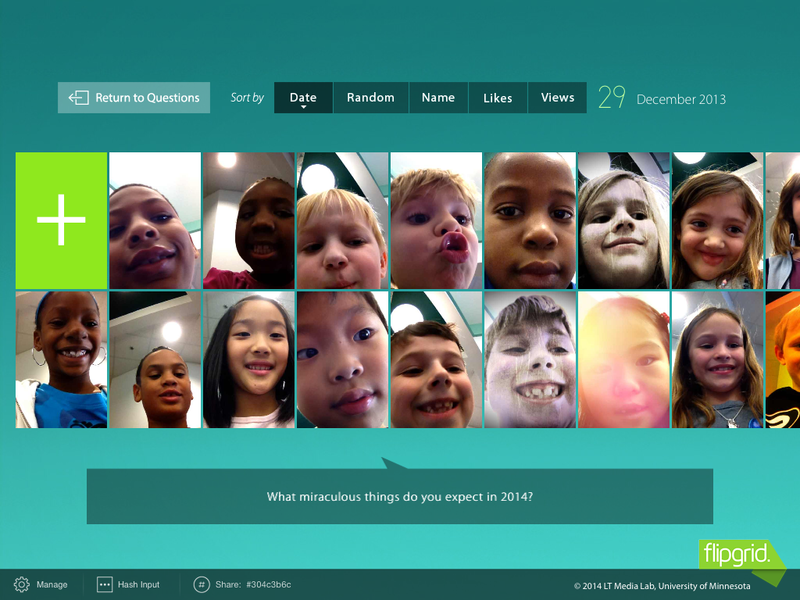 To capture our goals, dreams, wishes, and expectations for 2014, I created a Flipgrid. I gave them a quick tutorial on how to record a video into the Flipgrid by walking them through screenshots of the process. 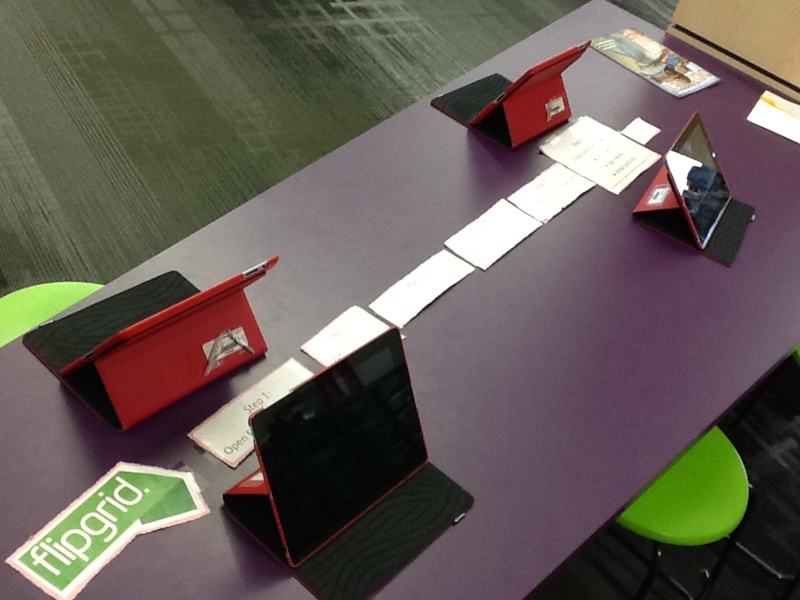 Then, I setup a Flipgrid recording station in the library. Over the past 2 weeks, students have written about their hopes and dreams in class and visited the library to record. It has been an amazing process to watch. Goals have ranged from reading goals to behavior goals and from school-related to extra curricular related. I encourage you to spend some time listening to their miraculous expectations and feel free to click the + and add your own. 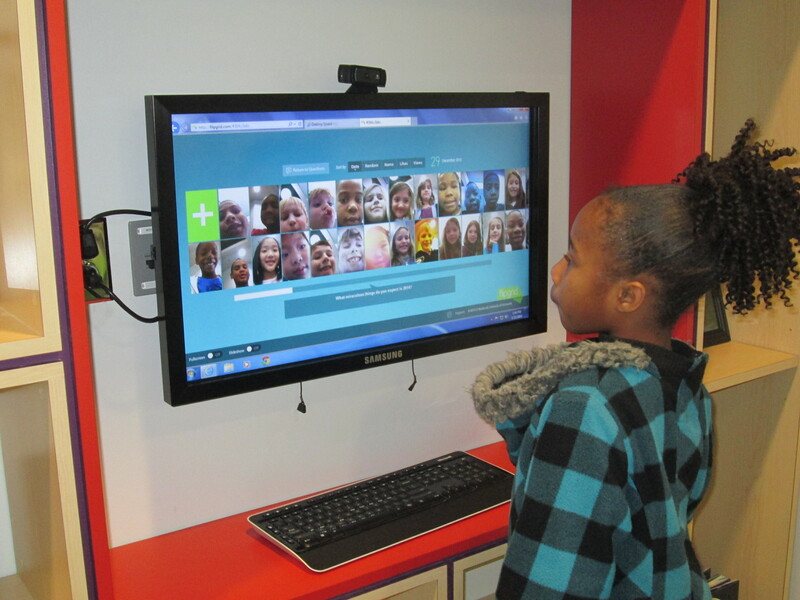 Students have enjoyed coming into the library and listening the the videos on our touchscreen computer at the front of the library. I can put the Flipgrid on slideshow and it flips through each video throughout the day. I’ve heard so many kids, families, and teachers using the word “miraculous” in conversations. Some students have even recorded their videos at home with their family. Our school embraced the phrase so much that we even put it outside on our sign. One more miraculous thing happened. Kate DiCamillo posted an opportunity on her facebook page to ask questions about her books. I asked, “What miraculous things have you expected that actually happened and what miraculous things are you still expecting?” Here’s her reply! This entry was posted in iPad, Reflection, technology and tagged 3D printer, flipgrid, goals, kate dicamillo, miraculous, participatory culture, student voice.